Delight all of your guests with this make-ahead, batch cocktail recipe for Meyer Lemon Whiskey Sours! Need an easy batch cocktail for your Big Game party? I’ve got you covered. These Meyer Lemon Whiskey Sours are simple, seasonal and totally refreshing, especially when paired with some deliciously indulgent game day food. Whiskey Sours are such refreshing treat this time of year. The tangy combination of citrus and whiskey never fails to brighten a gray day. And the addition of meyer lemons are such a treat in this cocktail. But let’s cover a few basics before we jump into the recipe. What ingredients are in a whiskey sour cocktail? The ingredient list for these Meyer Lemon Whiskey Sours is short and sweet: whiskey, meyer lemon and lime juices and simple syrup. Plus a few meyer lemon chunks and maraschino cherries for fun garnishes. For those of you who’ve never enjoyed a meyer lemon, they are a cross between a mandarin orange and a regular lemon. The rumor mill claims you can eat these like regular fruit as they are sweeter than your average lemon. 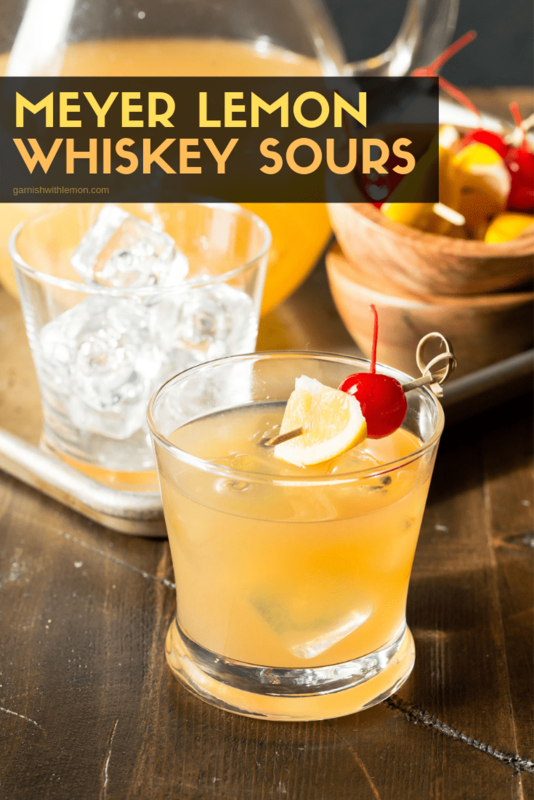 I’m not sold on that idea (still too much pucker for my taste), but they do make an excellent addition to the sour portion of these Meyer Lemon Whiskey Sours. I can’t find meyer lemons near me. Can I substitute regular lemons for this Meyer Lemon Whiskey Sour Recipe? Yes, you can! If you have super tart lemons, you may have to add just a touch more simple syrup to keep the drink from being too tart. Try the recipe as written and then adjust if needed. This handheld juicer makes juicing your lemons and limes a breeze! Gets every last drop of juice out of those fruits. I also like to strain my juice through a sieve before adding it to my cocktails. Keeps me and my guests from walking around all night with pulp in our teeth! These Meyer Lemon Whiskey Sours are a delicious and easy batch cocktail recipe for groups. 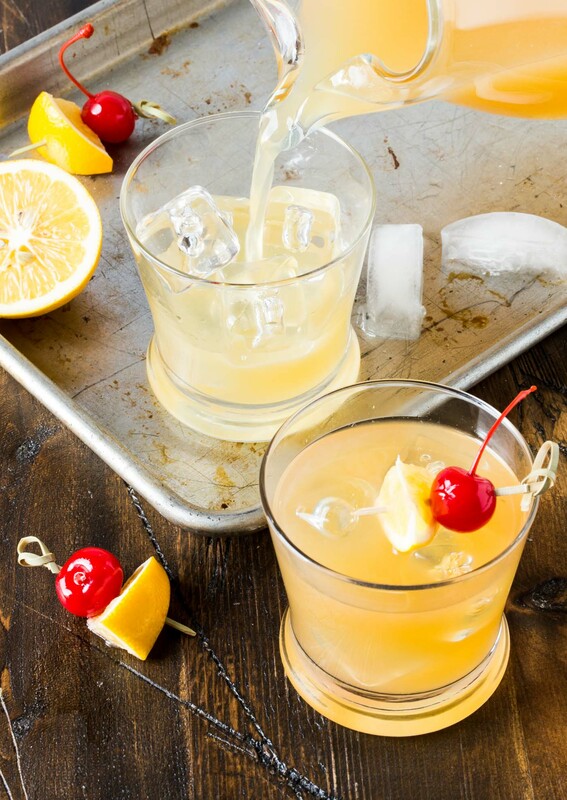 Make this whiskey sour recipe in advance to save your sanity before guests arrive. Juice your lemons and limes the morning of your party and combine with simple syrup in a pitcher. Before your guests arrive, either add the whiskey to the pitcher or set out the bottle for folks to add to their own cocktails. Waaay low maintenance for you and fun for your guests. Sounds like a winning party to me. Looking for more Whiskey Sour recipes? Check out some of these tasty sippers! These batch cocktails are great for a crowd! Combine juices, simple syrup and whiskey in a small pitcher. Stir gently. Fill low ball glasses with ice and divide cocktail evenly among glasses. Garnish with maraschino cherries. This recipe can be easily doubled or tripled. Feel free to tweak the amount of whiskey, too, based on your personal preference. You can purchase simple syrup or make your own by combining equal amounts of water and sugar in a small pan and heating until the sugar is melted. Cool the syrup before using. It will last for several weeks in the fridge. Oh, these are my hubbies favorite drink! I have yet to try Meyer lemons, but I am more than willing to try it in an adult beverage! I love your polka dot yellow napkin…so cute! Go for it, Taylor! I think you’ll love it! This is my favorite drink! I always order either a gin + tonic or a whiskey sour (but only when I know the sour mix is homemade and not out of bottle). I love your meyer lemon version! I knew you had good taste, Christina! 🙂 I think you’ll dig the meyer lemon/lime sour combo. I love a good cocktail especially at night. Meyer lemons…. mmmm! You and me both, Maggie! Thanks for stopping by! I love anything lemon! This drink looks so tasty! Your clock is ticking until it’s cocktail time for you again, Julia! I’m not a huge fan of whiskey… but my husband is! I could definitely drink it though if I made it like this! GREAT recipe! Trust me, Betsy, it’s great flavor combo. I hope you try it! I’m not big on whiskey, but it’s my husbands favorite so I always try ti get into it. These look like they might do the trick… I LOVE lemon! It’s hard for me to resist anything lemon, and these do NOT disappoint, Lauren. Give them a go! I’m gonna need to get my hands on some Meyer lemons…my husband (and I!) would love these!! 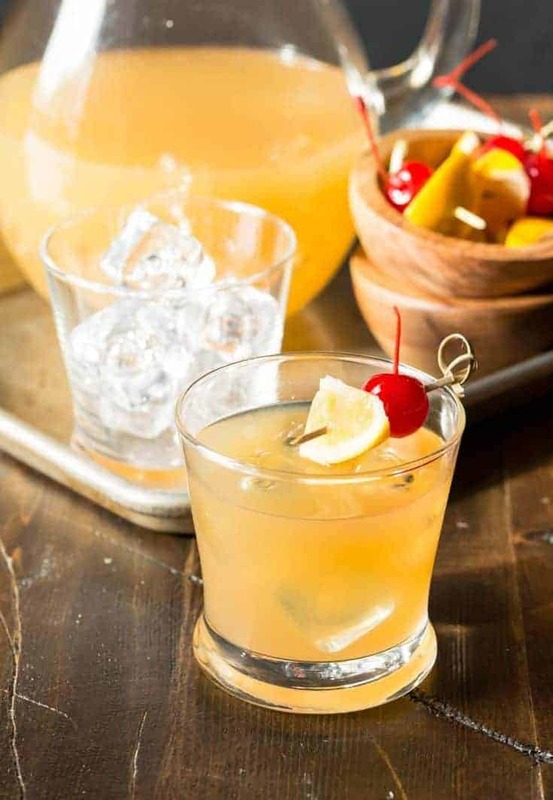 I love Meyer lemon in cocktails – this whiskey sour looks fantastic! This was my first time using meyer lemon in a cocktail, Julie, but it certainly won’t be my last. Thanks for stopping by! Whiskey Sours is my moms signature cocktail. I’m going to have to make a batch next time I visit her! You are a rock star daughter, Susan! Whiskey sours are the ONLY cocktail I’ll drink with whiskey, I’m more of vodka girl but love me a good whiskey sour. Love the meyer lemon! I think you’re going to like these, Nicole. The meyer lemon is a fun twist on an old favorite! Whiskey might just be my favorite liquor, I love Meyer lemons, and somehow I have never tried a whiskey sour! This needs to be remedied ASAP. Is it 5 o’clock? I don’t make many cocktails, but these are tempting me! So Mad Men, but also so updated and fun with Meyer lemons, which I love. Using Meyer lemons in this drink is such a fun twist! Thanks, Laura! Hi there, When you say “whiskey” do you mean bourbon, rye or scotch? I prefer bourbon whiskey, but feel free to choose your favorite, Peta.